Powerful, Affordable and Easy to Use, QuickShow is a FREE laser show software, providing all the tools you need to create both “live” and pre-programmed laser shows. 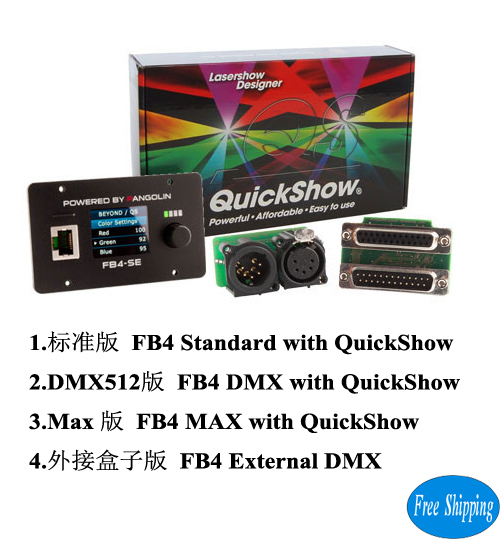 QuickShow is included with any Pangolin FB3QS or FB4 hardware purchase. Check out some of QuickShow’s most popular features below. Perform live laser shows with ease. QuickShow has a full live control panel, making it easy to run live laser shows to the beat of the music. And it is compatible with both MIDI and DMX, so that you can run the software from a console. We also have a built in map for the popular Akai APC MINI, for a truly plug-and play live experience. If you prefer to run pre-programmed timeline based laser shows, QuickShow offers a full suite of timeline based programming tools. And you can also set your own audio files, for perfect synchronization of lasers and music. Blue-Ocean Technology(HK)Co.,Ltd registered in Hongkong, a sales department there. Registered European TrackMark ( No.015379472 ). Our Manufaturer Company is "shenzhen Huatelai Photo-Electric Co.,Ltd", registered in Shenzhen City, china Mainland. Our Logo is "LH-LASER". 2F,No.4,Hengkeng Industrial Blvd,Shiyan Street,Bao'an District,Shenzhen City,China.